Dobla is a Dutch chocolate factory, which manufacturers luxerious chocolate cups, decorations and toppings. The chocolate cups, decortions and toppings are used in (instore) bakeries, hotels, restaurants, airlines, institutions and cake (dessert) manufacturers all over the world. With the Dobla products you can make all your cakes desserts and ice-creams look tastefull. Dobla chocolates: For your favourite desserts. This consumer produkt is at this moment only available in Holland and because of this only in the dutch language. 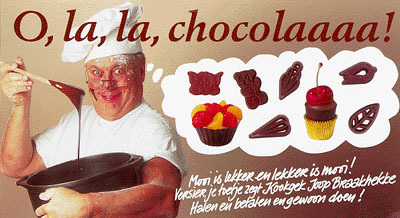 zogenaamde "Chocolade Speeltjes", "Chocolade Frivooltjes", "Vul Smul bakjes" en "Doe ‘t zelf bonbons" op de markt. Dobla is worldwide known for its quality, service and creativity. Would you like to experience Dobla, fill in the information form, or call one of our sales offices in The Netherlands, Argentina or The USA. Sorry, Your browser is not java capable. If it was, you would see a beautiful letter animation. Copyright © 1997 Dobla b.v. Holland. Last modifications: 16 januari 1997.